I remember several years ago watching the Blue Angels from work as they practiced for their show the next day. I’ll never forget how fast the F/A-18’s could rotate – you could actually see the vapor on the wings as the boundary layer separated. Very cool. I must say that I’ve never been a fan of the F/A-18 appearance wise. It just looks ungainly. The Academy kit however is a must have for anyone who loves big models like yours truly. There are several reviews on the net for this model, but here are my experiences…. The kit cockpit is ok – but I wanted something extra so I purchased the Cutting Edge cockpit (CEC32115 ) to add to it – the tub and ejection seat are much more detailed than the kit and do show up quite a bit with the canopy open. I also bought the Eduards Placards which are pre-painted and very nice – but the kit has most of the placards in decal form. For decals I got the 2Bobs Operation Iraqi Freedom “Knuckle Shampoo”. Assembly went together well – pretty much without a hitch. There were minor problems with the intakes which had to receive some putty. I use some stuff called Porc-a-seal which you can purchase at Home Depot. It dries quickly and sands really well. I printed a lot of pics from the web and detailed the landing gear with thin solder and Bare Metal Foil. The landing gear in the kit are really fantastic and are quite robust with metal inserts. You better get them in right and glued solidly as this is a big rather heavy bird. Do not sit the bird on the gear till they are really really dry. One of my wheels is a little skiwampus – it didn’t show up till later – too late to fix. The canopy is molded with a small seam down the center that can be removed with the edge of a #11 exacto knife and finished off with 1200 then 8000 grit sandpaper – and finaly a bath in Future Floor Polish. I decided to fold the wings because I’ve never done that before and it does save some room on the shelf – and with this big bird you need a lota space. I used Model Master, and Tamiya paints and started by preshading with black. Colors followed those suggested in the 2Bobs decal sheet. I weathered with thinned grey and black then coated with Future. Decals came next followed by a final coat of Microscale flat. Other weathering was accomplished with oils. Ok – this is what really happened – I did preshade the model as described above – then I sprayed it with the suggested colors on the decal sheet. I then put the paints away so they would be together for future reference as I got involved with something else. 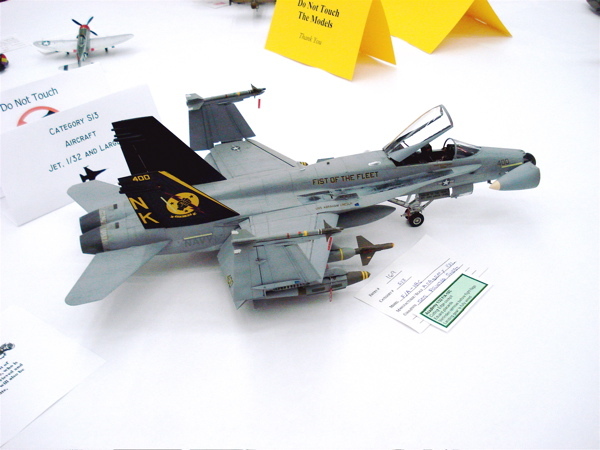 When I came back to work on the Hornet several months later – of course I couldn’t remember where I had put those paint bottles. As a result I just used what I had on hand so the paint job is a mismash of several different shades of grey. A few months later I found the paints in an unmarked storage bin. Lesson to learn – write down important information you will need when you resume a model build. As for the final weathering. I like large models – your eye will tend to get lost in looking at the whole thing and you can get away with some flaws – which is good for me as I seem to go from one goof to another. On this model I had decals just fall off in my hand – they came off with masking tape and I made them disappear with overspray. I had parts fall off, break off, disappear, and just plane put on wrong. Now with weathering you can cover a multitude of sins from messed up decals to bad paint jobs underneath. This was the first time that I tried oil paints and found them to be another medium to cause grief. The stuff gets on your fingers – then onto parts of the model that you don’t notice till much later. You really have to watch yourself when you are a klutz like I am. I did manage to mask off a few panels and weather them with the oils – which I thought turned out nice. Now as for the twin tail. I glued them on as they just push in the slots and seem to settle down at a preferred angle. All seemed well but there isn’t any head on pics of the model in the instructions to enable you to get the angle correct on the vertical stabs. This little fact was made known to me at the last meeting – he was discrete tho – “you know you got the tail wrong don’t you?” And he had pics to prove it! I am appreciative to him for this as I then was able to fix it. All you have to do is bend the vertical stabilizers till the glue brakes – simple right? I elected to build it with the nose cone open so the radar unit could be seen. If you do this you better build a case for it. My son had a friend over one day – later I noticed the nose cone had broken off and was sitting next to the model. Why oh why do people feel the need to touch touch touch? I glued it back but didn’t get it fixed right. It’s hanging off at an angle now and will have to be fixed again. I’m tempted to use a big wood screw this time and be done with it. I finished the a/c with 2Bobs decals depicting the Cag’s bird which went on very nice – they settled down nice – but I had trouble with a couple coming off – maybe I just used too much Microsol and Microset. The walkway decal on the canards looked just too black. On the real bird the walkway paint wears off over time and I wanted to depict that. This was accomplished with diluted paint that was airbrushed carefully over the decal. I toyed with the idea of masking off the area and painting it that way – I’m sure it would look great – but I guess I was too lazy. And I figured I would find a way to screw that up too. Many of the 800 odd parts deal with the really complete set of weapons loads – decisions decisions – I finally put on a load that seemed logical and looked good. I did end up masking off many of the items to spray the rings instead of using the decals – the sprayed on paint looked much better than the decals. I still have enough stuff left over to outfit two more planes at least! Finally I added remove before flight tags by Verlinden. The sheet I used had 1/32, 1/48, and 1/72 scale. The 1/32 looked too large – so I used the 1/48 scale. Now where to put it – and how do I keep the dust off? Wanna see more pics? GO HERE.